What’s the best way to learn digital marketing in 2019 for free and at the comfort of your own home? Fortunately, there are a lot of free and paid online resources that can help you acquire the skills needed to become a modern digital marketing manager. In the guide, you will learn what are the required skills for digital marketers and a list of resources to teach yourself digital marketing in the fastest possible way. Before we dive in, it’s necessary to explain what is digital marketing. Digital marketing is the process of marketing on the Internet using all available online and digital channels. This is also known as online marketing and offline marketing respectively. 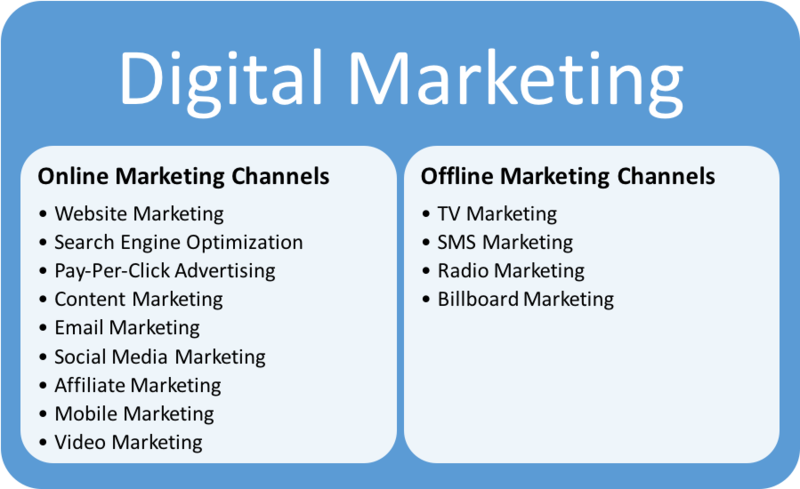 The diagram below shows the different channels that make up digital marketing and how they are grouped into online and offline. It should be noted that the majority of people (if not all), when they talk about digital marketing, they actually mean online marketing which automatically excludes the non-online channels. To become a successful digital marketer, you need to develop the skills required to work with all online marketing technologies. In addition, you need to acquire the necessary knowledge so that you can combine them together to achieve the best possible results. It’s hard work that requires a lot of patience and perseverance but the good news is that you don’t have to attend college or a classroom course to become an expert in Digital Marketing. You don’t even have to spend your time searching Google for which resources to follow. What I’ve gathered below is the best resources (almost all free), you can follow and build your skills from the comfort of your home. Search engine marketing is a major component of digital marketing. SEM has to do with marketing on the various search engines either using Search Engine Optimization (SEO) or Paid Search Advertising (Google Ads or Bing Ads). SEO is the process of optimizing your website so that it ranks higher in the search engines organic results. SEO is important in online marketing because it can drive highly targeted traffic to your website. It’s a slower process compared to Paid Ads but it can generate better results in the long term. If you are a beginner, it’s necessary to understand that SEO is not a static discipline but it changes all the time. Google is reportedly making more than 250 changes to their ranking algorithm per year. 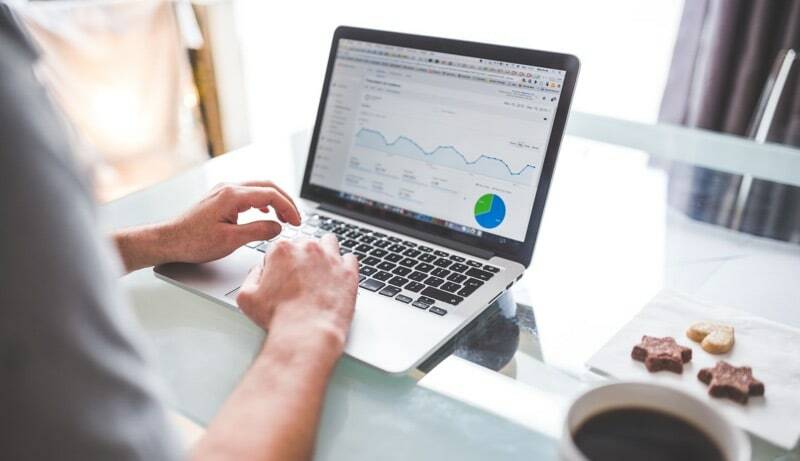 This means that if you want to pursue an SEO Career, you need to monitor the SEO industry for changes and adjust your digital marketing campaigns accordingly. 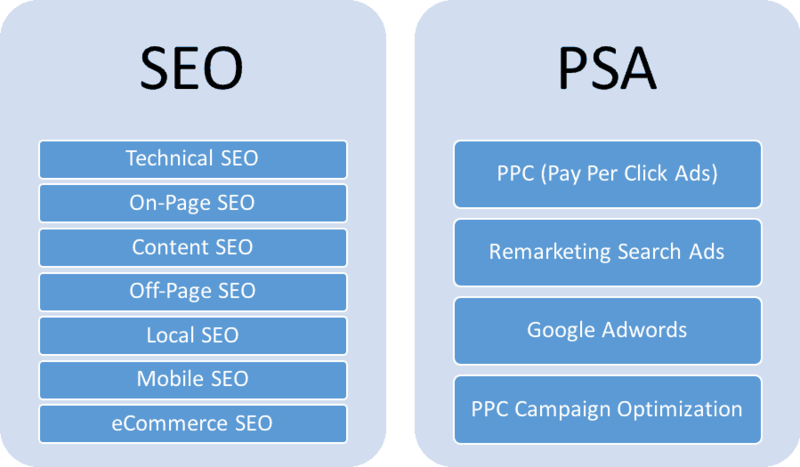 Pay Per Click marketing or paid search advertising (PSA) is the other component of search engine marketing. With Pay-Per-Click ads you can reach your target customers faster than SEO but you pay every time someone clicks on your ads. Currently the biggest PPC network is Google Ads, which allows you to show your ads in Google Search Results, on Google properties (like Gmail and YouTube) and on websites that participate in Google AdSense. Learning PPC is not difficult, you can go through the various online courses (see below) and become a PPC Certified expert in a couple of months. Getting a certification alone does not make you a good digital marketing specialist. You need to work with PPC campaign management and gain the necessary practical experience. At the end of the day your role as a digital marketing professional is to combine the results of PPC with other channels (like SEO or Social Media Marketing), and deliver the best possible outcome for your clients. Every digital marketing campaign is based around content. Whether it’s SEO, social media marketing or email marketing, you need content to reach and engage with your target audience in the different channels. Content marketing is the process to identify, create and promote the right type of content to the right audience. To become a good content marketer, you need to have great writing skills, SEO copywriting skills and analytical skills. In the beginning of this post, I’ve mentioned that a good digital marketer, should be able to combine the different online marketing techniques for the best possible results. That’s exactly what inbound marketing is all about. The role of Inbound marketing is to co-ordinate the activities of all other digital marketing campaigns to provide for a remarkable user experience. The overall goal is to have a solid process for attracting new customers, engaging with them, gaining their trust and earning their satisfaction. Companies that can do this successfully are more likely to grow their customer base faster than companies who run isolated campaigns. Your job as a digital marketing manager is to ensure that all digital marketing campaigns share the same goals. I think that everybody agrees that nowadays is hard to imagine a World without Facebook or Twitter. Social media networks have dominated our lives and our approach to digital marketing. Since the goal of digital marketing is to connect with your potential customers in their favorite channels, a new form was marketing was born and that is social media marketing. Social media marketing is what the name implies i.e. marketing on the various social networks for the purpose of finding and engaging with your customers. Facebook is by far the most widely used network with more than 2.3 billion active monthly users. A great place to start learning social media marketing is to follow the Facebook online courses. They will teach you everything you need to know about Facebook Paid Campaigns. Once you feel comfortable with running social media campaigns on Facebook, you can enhance your skills by learning more about Pinterest, LinkedIn and twitter marketing. Email marketing is not dead. Despite what you might think, email is still one of the most effective ways to turn visitors into customers and existing customers into repeating customers. To run successful email marketing campaigns, you need to get to know your audience first otherwise your emails will end up in the spam folder of your users. You can think of email marketing as the last piece in the digital marketing puzzle. While all other marketing techniques concentrate on finding new customers, email marketing is about closing the deal. To get started with email marketing you first need to decide on the tool to use and then learn how to use it. One of the skills each digital marketing professional should develop its analytical skills. Remember that the role of a digital marketing manager is not to learn how to run SEO or social media campaigns (that’s the job of the SEO expert or Social media marketing manager), but to know how to orchestrate all processes so that they work towards the same goals. To be able to do that, you need to learn how to use various data analysis tools like Google Analytics and Google Search Console. Data reporting tools like the Google Data Studio and digital marketing tools like SEMRUSH. I’m sure that you’ve realized by now that learning digital marketing is not an easy job. It requires a lot of reading and hours of practice to learn how each of the techniques work individually and how you can combine them together for maximum results. The good news is that you can use the resources above to learn digital marketing at home and for Free. All you need is willingness to learn and a lot of patience. Start with SEO. Many of the concepts used by PPC, content marketing and social media marketing are based on SEO principles. Building your SEO skills first will make it easier to learn the rest. Practice, Practice, Practice. Internet marketing is not a theoretical concept but it’s mostly practical. Once you understand the theory behind a strategy, try to execute it in practice. Monitor the results, optimize it and learn from your mistakes. Get Certified. As you progress through your learning, try to get certified. It’s a great way to showcase your expertise. In the above resources, you will find links to online courses that offer a certificate upon completion. Work with experienced Digital Marketers. Aim to work under the supervision of experienced digital marketers. They can make the transition from theory to practice easier and you can learn a few tips and tricks not written in any books or courses. Start your own digital marketing blog. Having your own blog will help you practice what you’ve learned and demonstrate your expertise. Also, when you start writing about digital marketing, you can assess how well you know a topic or not. Never stop learning. Digital marketing is an industry that changes all the time and learning never stops. It’s your job as a digital marketing professional to stay in synch with latest developments keep your clients informed. What are your favorite websites for learning Digital Marketing for free? Let me know in the comments if I missed out on any useful resources.